GO-15-HF™ 8oz GO-15-HF™ 12oz GO-15-HF™ 32oz GO-15-HF™ 1gal Discount Packs Need More? Recommended for 4 cyl engines and small 6cyl engines - treats up to 4 quarts of engine oil. Recommended for 6cyl engines and small 8cyl engines - treats up to 6 quarts of oil. Recommended for whole car or multi-car treatment, exotics and high performance use - treats up to 16 quarts of oil. Recommended for small fleets, multiple cars, vans and trucks, marine and other commercial vehicles. Recommended for large fleets, several cars, vans and trucks, marine and other commercial vehicles. Hummer is one of the oldest automotive industries in the world. For more than a century Hummer has displayed uncompromising performances, and daring design. After a while every car engine starts to age. Even an electric powered engine needs to be cleaned. GO-15™ will give every Hummer vehicle the clean engine a driver needs for a fully functioning car. Our products work immediately after it is applied to your Hummer engine. GO-15™ works well with every chemical including petroleum and synthetic oils, greases, and hydraulic fluids. For every 5qt engine add 10oz of GO-15™ at every scheduled oil change. Our product is used for any vehicle no matter how old or new a Hummer is. GO-15™ helps keep metal parts in new running condition for long periods of time. For older vehicles, it will repair years of wear and tear that restores lost performance and efficiency. After your first engine treatment it will take roughly 800 to 1,000 miles before you notice an increase in mpg. Continuing to re-treat your Hummer engine with GO-15™ , 8 oz. after each oil change you will notice that you have increased your fuel economy from 15% to 20%. Failed at 1600 ft-lbs, approximately 25 seconds into a one minute run. Failed at 1300 ft-lbs. approximately 12 seconds into a one minute run. Click here for more detailed tests information. There have been a variety of different engines from Hummer that our products have handled. Our customers were constantly satisfied with the GO-15™ engine treatment on their Hummer vehicles. Our products have provided the best increases in miles per gallon and a longer life for several Hummer vehicles whether old or new. Dr. Aiden O'Rourke M.D. achieved similar results in his 1995 Hummer . His average day-to-day MPG in the first two years of ownership was 13.8 to 13.9 MPG. After his initial engine treatment of Engineous GO-15™ his mileage increased to 16.6 MPG. Since retreating his engine Dr. O'Rourke has experienced a consistent 17.2 MPG, an overall increase of 24.6%. "I was so impressed by the results, I purchased the rights to the product and I started the company Engineous. To date, GO-15™ is the most economical method to decrease emissions and increase fuel economy". *Estimated Calculations Are Based On 3,000 Miles Traveled Per Oil Change and 6 Cylinder Engne Using 12oz GO-15-HF™ Per Oil Change. *Get Over 300% return on your investment. 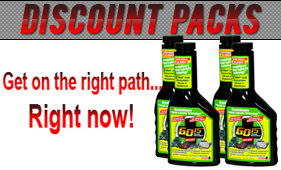 engine treatments with GO-15-HF™ Just $64.85. If your oil goes there - so does GO-15-HF™ ! Where can I use GO-15-HF™ ? Car Brands You can Use With GO-15-HF™ ? Receive an extra 15% OFF Coupon Code on Already Marked Down Discount Packs After Subscribing to the GO-15-HF™Newsletter *. "I use GO-15-HF™ on all my cars and I've noticed a big difference, I would recommend GO-15-HF™ to anyone... "
See what more satisfied customers have to say.